CRIRS REI, LLC today announces MiBeerAge 2.1 for iOS, an update to their iPhone, iPad, and iPod Touch app that calculates the age in days of any bottle or can of beer. In most cases beer should be consumed within 90 days of bottling. Because beer manufacturers use coded bottled on dates, or expiration dates that sometimes exceed 540 days after bottling, most imbibers don't realize they're consuming aged product. The app includes beer imports from Australia, Belgium, Canada, China, Czech Republic, Germany, Great Britain, Holland, Ireland, Italy, Jamaica, Japan, Mexico, and the Philippines. The app also includes well known American brands, as well as some of the great American Craft Brewers. There is also a built-in link allowing users to contribute additional beer brands to the applications growing library. See free coupon offer below. CRIRS REI, LLC announces MiBeerAge 2.1 for iOS, an update to their iPhone, iPad and iPod Touch app that calculates the age in days, of any bottle or can of beer. In most cases, beer should be consumed within the first 90 days of bottling. Because beer manufacturers use coded bottled on dates, approximately 99% of the beer consuming public don’t realize when they’re consuming expired or aged product. Even when manufacturers use an expiration, best by, or remove from shelf date, the indicated date can be up to 540 days after the beer was canned or bottled. More than 80 different brands are included with regular, free updates. It also has a built-in link to the MiBeerAge.COM website allowing users to contribute additional beer brands to the app's growing library. The current list of brews included in the application can be viewed here along with several free coupon codes each day from March 13th through St. Patrick's Day March 17th. Using the MiBeerAge application is simple, and the GUI is intuitive and easy to operate. On launch, the top half of the screen is taken up by the cylindrical iPhone odometer display listing more than 80 different brands. The user rotates the display until their choice shows through the translucent selection window, and then touches the "Select Your Beer" button beneath. This brings up the input screen, where the user enters the appropriate alphanumeric code located on the can, bottle, or packaging. An "Example" button is available to give a sample of the code and its location for all of the listed brands. 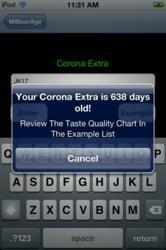 In the case of "Corona Extra" the "Example" function advises, "On the bottom of the can, neck of the bottle, or the beer packaging there is a born on date code, e.g. JH12A088, AL02A097 or HB23B032 etc. The date information is a coded born on date. Enter the first four characters e.g. "JH12", "AL02" or "HB23" from your bottle, can, or package and we'll calculate the age from the day it was born, before a purchase is made. Enjoy your beer!" Hitting the Enter button after entering the code computes the exact age, in days, of any beer they may be planning to purchase or consume. MiBeerAge 2.1 is $1.99 (USD) and available worldwide exclusively through the App Store in the Lifestyle category. Located in Cincinnati, Ohio CRIRS REI, LLC is a privately held company founded in 2009. The company, which specializes in mobile phone apps, is led by company president Roderick Fitzgerald. Copyright (C) 2011 CRIRS REI, LLC. All Rights Reserved.